Pretty much the whole Photography Life team uses Lightroom (Tom, hint hint) and we all love it. 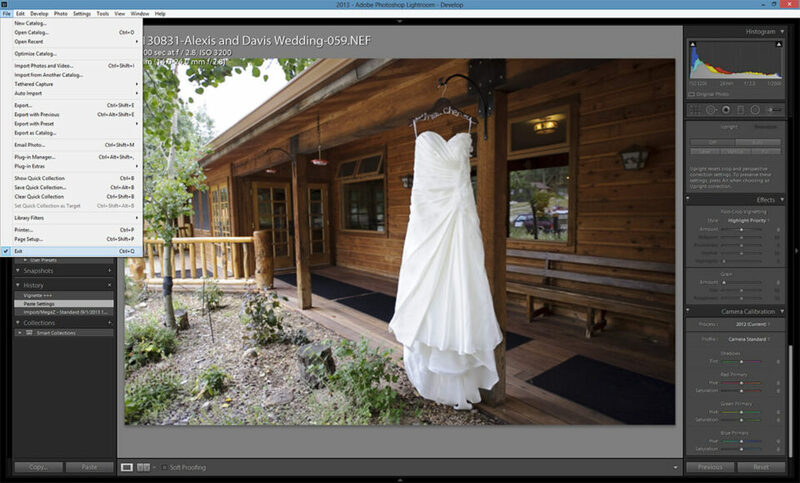 Without a doubt, Lightroom is an integral part of many photographers’ workflows. It is easy to learn and use, comes with a boatload of great tools and makes the process of managing and organizing images a breeze. However, it seems like Lightroom is often plagued by various bugs and annoyances, some of which have been there for a very long time. One of those nasty old timers, is the Lightroom Exit Bug (I came up with this title, since I have no idea how else to call it), which has been plaguing Lightroom for a very long time, I believe since version 2 or 3. 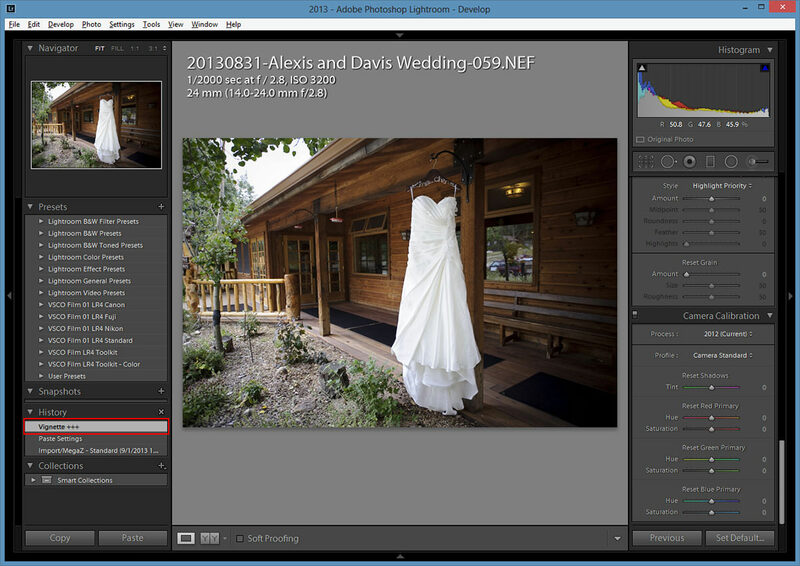 It also occurs in the latest release of Lightroom 5.2 RC. Basically, at some point of time, Lightroom’s shortcuts and menu windows just stop working and random presets get applied to your photos. The bug also prevents you from being able to exit out of Lightroom. The only cure is to exit out of Lightroom by clicking the “X” on the top right corner of the Lightroom window. I do not know the exact reason for this bug and why it exactly it occurs, since it is rather random. Sometimes it occurs after editing 10-15 images and sometimes it will show up after an hour or more of editing. I noticed that it typically happens when working with batches of photos. Since Lola does a lot of editing of wedding photos, she has been seeing it a lot for quite some time now. 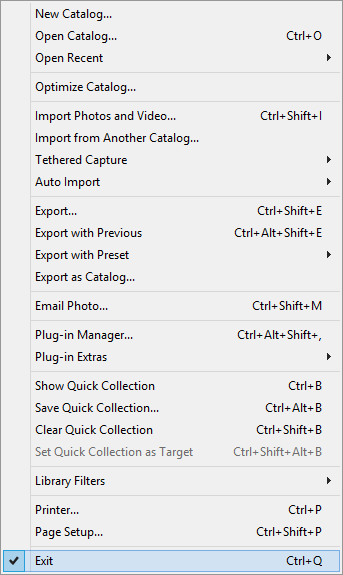 Lightroom never closes, and when you click the File menu again, you see a check mark right next to Exit, as shown in the screenshot above. No matter how many times you click this, Lightroom completely refuses to close. Most of the shortcuts don’t work either – pressing CTRL+Q does absolutely nothing. This may not be an issue when you work on a single file, since you can roll back the change using the History panel. But I once had hundreds of photos selected and when I pressed CTRL+Z, a black and white preset got applied to all those images. Since I could not roll back the action, I had to close out of Lightroom. When I re-opened the catalog, all of the presets were still there. I had to literally go through each image, one by one and undo the last preset (all images were edited). Needless to say, it was a very frustrating experience for me, since there was no way to undo the last action and I did not want to restore from a previous backup. This is exactly the same bug that I have been seeing all these years. I really hope that Adobe’s development team will make a note of this particular bug and fix it in future releases of Lightroom. Their challenge will be to first identify it, since it is not something that you can reproduce right away, each time. Question to our readers – have you seen this particular bug yet? If yes, can you tell us about your setup? (PC or Mac? What version of Lightroom are you using? What operating system? Single or Dual screen setup?). Thank you! I have been using LR since almost a year and this is the first time I have come around this bug. Never experienced myself, though I should add that I’m just starting to do batch processing (approximately since two weeks ago). I have LR4.4, on a Windows 7 Home Premium 64bit Samsung Notebook (Intel Core i7), and just using the notebook’s screen. I will try and see if I can get this bug this week, as I’ll be going home for the national holidays (Chile) and since almost all of my family now have laptops, hopefully I’ll be able to take the desktop’s LCD and experiment with a dual-screen set-up. I’ve only just begun experiencing this bug after using LR for over 4 years. Not the exit issue you describe but certainly the Ctrl+z applying a Develop preset. I’m not getting a random preset though, just the last preset I’ve used (could be linked to Ctrl+Z being the “go back” of “last” command). I’m using LR 5.2 on i7 – 16Gb Ram Win 7 x64 with dual screen setup. Luckily, I have not seen this bug. Perhaps because I’m using the Mac version (LR5) of LR since version 1. THat’s not to say that my experience has been trouble free. One problem that’s plagued me since LR4 has been when I’m working with plug-ins via Photoshop (now in PSCC). The transfer from LR to PS is no problem. It’s when I save the file and bring it back into LR that things change and the image barely resembles what the image looked like when saved in PS. Back in LR the exposure gets a wild increase in exposure as well as adjustments in contrast, highlight/shadow and clipping. The Basic adjustment panel is the only panel effected. So, like Nasim, I have to go back and change everything. A funny thing about this is that the history panel does not reflect these changes, so I can’t just step back in history. Drives me absolutely NUTS! I have been using lightroom since ver 1 or 2 on windows pro 7. Do not have dual screens and have not used batch processing. Have not seen this problem. I did see all my shots shift and look off all of a sudden soon after installing ver 5. I wondered if a batch process got triggered somehow. I thought I would have to edit everything all over again but didn’t have time. Then by some miracle, next time I looked, they all went back to looking fine. No idea what happened or how it got fixed. I have been using Lightroom since the start. I may have missed one beta or release candidate. I have used dual screens since the capability was 1st known by me. Right now, I have dual screens, but only using one of them for Lightroom. Not sure which OS I had with LR1, but the most recent has been with XP Pro, and Win7 Ultimate. I have never had this problem, but I use presets sparingly. I do have one bug that is almost always present. Loupe Info. If you choose to show exif info, etc. when in loupe mode & you choose Info 1, The hidden frame around the info sometimes offsets some of the image. Very annoying. The other thing I have noticed with LR5? ?, is that the Minimize/Maximize (Restore)/Exit boxes disappear. sometimes. BTW, I can always exit Lightroom (if it is the selected application) with an Alt-F4. I use lightroom 30+ hours/wk for the last 4-5 years and haven’t seen it. Dual screen, v1.0-5.0, Win7-8 64-bit and Mountain Lion on a laptop. Though I should say I never use lightroom on both screen. It’ usually another application on the 2nd screen. How awful. I hope I’m not jinxing myself but I’ve never seen this bug and I’ve been using LR for 3 years, including LR3, 4, and 5. I’m using an iMac. I hope you find a fix for it. I think this issue happens on PC – never seen anyone encounter it on a Mac. Note that the Youtube video also shows the same problem on the PC. Hi Nasim, as all of yours, interesting article. Just for the sake of a suggestion, can you tell us the exact Windows version you’re using? Does it happens on a “customized” OS, like a branded and embedded version, or have you assembled your PC yoursef ? Sometimes branded SW environments have some drivers, or services “On top” of the pure Windows environment, that may cause some applications to have crashes of bugs. The video section (and the API used for) is another important section to inspect further. In a word, you should point out the SW environment where this bugs happens, to see if it depends on LR itself or by a “unlucky” mix of OS + drivers + settings + other SW installed LR apart. I have seen this behavior on the HP laptop running Windows 7 and LR 4.X. Besides that, there were other very annoying things going on so I have switched to Mac around Christmas time. Since the switch, never seen LR or PS glitching the way they were on Windows. I’m not saying that Mac is perfect, this is simply my experience. Saken, looks like this particular bug is PC-specific. I have also gotten plenty of feedback from other Mac users that have never seen it. I am using Lightroom since the release of LR3, and I have never seen such a bug in my workflow. I am using windows (Seven then 8), single screen connected to a laptop. Thanks for the feedback Nicolas! I first noticed this on LR 4, and it amazes me that Adobe does not have it on their to-do-list. To me it happends after a long editing section. When I notice LR is starting to act funny, I go to grid view, select the grey area to deselect all photos (because Ctrl+d becomes untrustworthy as shortcuts become jumbled) and then exit by right-clicking the program on Windows taskbar. The cardinal sin is to exit after a batching process with all photos selected, this happend to me once and it was a waste of time having to undo the history on over 700 photos individually. I started with LR3, used LR4, and just last week upgraded to LR5. I work on a MacBook Pro that’s maxed out as to memory and speed. I did have one terrible bug that started with LR 3 and finally, after many hours of waiting and phone calls to Adobe, got resolved in LR4: Whenever I would send a photo from LR to Photoshop for further editing, when I saved and then closed it in PS, the image from PS would be on my hard drive but not in my LR catalog. So far…knock wood, fingers crossed, etc….I’ve not had this bug with LR 5 and I notice that LR 5 seems to be faster than its predecessors. Have you gotten in touch with anyone in the upper echelons of Adobe about your problem? Perhaps because you have this (wonderful!) website, you have access us mortals don’t have??? Good luck, and please keep us posted. Thank you Kathleen! I have not yet reported this bug to Adobe, since I wanted to find out how frequent it occurs. From the feedback I have received so far, looks like this issue is fairly common on PCs. Hopefully we will gather enough info to send to Adobe, so that they address the issue. Never witnessed it. I am on v4. While you might lose the most recent changes to made when developing, since you know that trying to EXIT the normal way may introduce random changes, try Force Quitting instead. On a Mac, click the APPLE Menu in the upper left corner of your screen, then pick Force Quit, then pick Lightroom and, finally, click the Force Quit button. In Win7 and earlier, press Ctl-Alt-Del and click Start Task Manager (or similar wording). In the Task Manager, pick the APPLICATIONS Tab, then select Lightroom. Lastly, click the END TASK Button down below. Thank you Phil! Quitting is not the issue – it is pressing the CTRL+Z buttons to undo work is what applies a preset. That’s the part that is very annoying and can cause a lot of grief. You do not have to force shut down the application – just pressing the X on the right corner (on PC) will terminate the Lightroom session. I see this bug all the time after working on a batch of photos for a couple hours. Suddenly when I hit CTRL+Z it will apply one of my presets and there is no longer an Undo available. I have to select the previous edit to the photo to “undo” it. Once I close out of Lightroom and open it back it up the shortcuts work properly again. Ben, excellent feedback! Looks like the problem is fairly common – got some replies on email and Facebook as well from other people that reported the issue. Hopefully we can send all this feedback to Adobe, so that they can address it. I use LR 5.2 on an iMac running OS X 10.8.4. I have never seen this problem. To date the mac implementation of LR has been very stable for me, if at times a little slow to render images on the screen (I shoot with a D600 and store RAW files as DNG). Things like this is why I bit the bullet and went to Mac about 4 years ago. I almost never have this kind of problem. The Mac is so stable. I would be hard pressed to ever go back to Windows. Jack, many of us don’t do it for cost reasons. I would love a Mac, but if I spec one according to my needs, it will cost me $5K+ :) Plus, I have been using PCs for 20 years and the one button mouse is not something that I can get used to very quickly! FWIW, the Mac supports multi-button mice, and the Magic Mouse Macs come with will support left and right click. If your current mouse is USB and from one of the bigger players, it should be plug and play. You can download drivers from most manufacturers, but I’ve always used USB Overdrive, which I think works better than most vendor drivers. Can’t help you with the cost thing, though. All I can offer is that the sticker shock also gets you a bit more longevity in my experience. The average lifetime of my Macs runs 6-7 years, vs 3-5 for all my day’s Windows machines. Though part of that is that I get so annoyed trying to update his machines and keep them kinda virus free that I end up buying him new hardware every few years because it’s easier than wasting my time trying to manage Windows (and I ran my own Linux desktop at work for a few years in the early 00’s, so it’s not like I can’t handle non-user-friendly tech). My familiarity with Macs is obviously close to none :) I just remember seeing a one button mouse in a store and it was not something I liked. But it is nice to know that a two button setup would work fine, so thanks for clarifying that. I’ll be honest, those new large screen iMacs with retina display look gorgeous. Not sure if they are speedy, but from the specs it looks like you can get some nice ones with Core i5/i7 processors. Mac Pro laptops also seem to be great. Not sure what would be equivalent to my Core i7 machine that I built myself, with 32 GB of RAM, 2x SSD + 2x SATA drives in RAID 0 configuration. Last time I looked, a setup like that was $5K+. I think they have full Mac desktops, although last time I read, Apple thought about discontinuing that entire line of desktop products. I found that 16GB RAM on Mac feels more like 32GB on Windows. Don’t worry about mirroring built-in disk, you can bring the Mac to Genius bar and they will swap it in 20-30 minutes. I never seen Windows been able to boot from it’s own backup. Mac can do that. Also, I can boot my Mac from my wife’s MacBook Pro HDD over LAN. Apple is not giving up on the desktop market beyond the iMac, but they are taking it in a pretty radical new direction with the upcoming Mac Pro redesign (see www.apple.com/. From all accounts, the iMac and MacBook lines are all very good performers, and I know anecdotally of a lot of photographers using MBPs as their portable photo post-processing studios. If you are pricing Apple hardware, the one bit of advice I have is NOT to upgrade anything that you can replace on your own because Apple overcharges a LOT for components. For most Macs, that means memory and internal HDs, but not video cards. HDs/SSDs are a commodity and any one will do. Memory is technically the same as in a lot of Windows boxes, but Macs will be much finickier about memory and reject RAM that’s not up to snuff. I’ve been using Other World Computing (www.macsales.com) for years to get upgrade components. They’re not the absolute rock-bottom prices out there, but they’re close and they know Macs inside and out (and provide lots of self-serve and as-needed support to help you out). Video cards need Mac firmware, and I think some recent ATI models can be re-flashed to work in a Mac, but I’m not up-to-date on that to be honest. Mac multi-button mousing has been around forever. I see this happen periodically. Usually once or twice per session. I often do batch processing but do not really notice it then. It typically happens when I hit Ctrl Z to undo an adjustment. Once I restart Lightroom it is fine. LR 5, Windows 7 home premium, 16GB RAM, i7 processer, single screen. It is extremely annoying. Aaron, is your operating system 64-bit? I’ve never seen this bug either. I’ve been running Lightroom 2, 3 and 4 on Mac OS X since 2009, many hours a week. I use Windows XP & Win 7 at work, and I can somehow relate to this bug, albeit with other programs. The keyboard sometimes gets another configuration. Dunno which, dunno why, dunno how, but all the programs that make heavy use of keyboard shortcuts (Photoshop, VIM, …) become totally unusable. Sometimes it’s “Alt Gr”, sometimes it’s just @, sometimes it’s another keyboard layout, sometimes it’s “Caps lock”. The only thing to do before becoming crazy is to stop using the keyboard, save everything and reset. Using Lightroom 5.2 on a Windows 7 system with quad core processor, 16Gb RAM and have had no issues on any version of Lightroom and I’ve owned every version since Lightroom was launched. I am glad it doesn’t affect me……………..yet! Yesterday I experienced a similar, although not exactly identical, bug (for the first time): after editing a couple of images in the develop module, jumping back and forth between the images without exiting develop, copying and pasting develop settings from one image to the other, sometime this stopped working. Ctrl-Shift-C stopped presenting the dialog for choosing the settings to be copied, and Ctrl-Shift-V stopped applying any settings. The corresponding buttons on the left stopped working as well. Without much fiddling about I exited Lightroom and was not (!) asked if I wanted to save a copy of the catalog. Unfortunately, I cannot remember whether I exited using the Exit menu entry or by clicking the “X” on the top right corner of the Lightroom window. After restarting Lightroom everythings worked well again, and on the next Exit I was asked if I wanted to save a copy of the catalog. I had been using Lightroom 4.2 for about a half of a year and since 2 Month I am using Lightroom 5.0 under Windows 8 Professional 64-bit in a one screen setup. The catalog and the images are on an HDD, the preview cache is on an SDD. Fortunately, I have never experienced this bug before, and I have never experienced your “Exit bug”, exaclty as described above, before. I’m sure you’re sick of hearing from Mac people :) but I also have not seen this bug (v4, MacBook Pro 13″). What I have experienced though, is for the brush/clone cursor to disappear after a prolonged editing session (e.g. Weddings). The application doesn’t freeze, but exiting and re-entering the Develop module doesn’t make the brush reappear, and I am forced to quit and reopen LR. I haven’t experienced the freezing but recently I had a huge amount of saturation applied to 200+ images that I had not done. I opened LR (3) to look at a pic and saw the saturation was horrible, the people in it were orange! I had not done anything like that. I had to manually correct each of the images. So not sure if it is connected to your problem, but it was very annoying. YES, this happens to me too, but I only noticed it after I installed custom presets, so I thought it must have been the fault of the presets. Its really annoying. I’m running lr5 on a hp laptop running win8 and has an i5 processor and 8gb ram. This bug occurs all the time, after a couple of hours of editing. When I hit ctrl+z a random preset gets applied. PC, Lightroom 4.1 64bit Windows 7 Ultimate 4bit, single screen setup. This bug occurs all the time, after a couple of hours of editing. When I hit ctrl+z a random preset gets applied. Also happens in Lightroom 3. Hello Nasim, Just lately I’d experience inconvenience with lightroom. When I press Ctrl+Z, it wont undo the last setting or adjustments I made, instead the screen will just say “Undo last save history”…and the settings wont undo…For my convenience I just look up in the history panel then click the last settings/adjustments Id made. Did you experience this too? Never had this bug with the above system config, LR 3, 4, and currently 5. B. That anyone would continue to use this product on a production basis. Using a product that apparently can run wild like this is a dangerous thing and the fact that the developers have apparently ignored it makes you wonder what other insidious bugs are lying in wait. Thanks for the information… Great blog, as always. I had a similar issue over the weekend where I could not remove dust removal spots from some images I had batched them out to with LR5 on a PC (Windows 8). I shoot spherical panoramas, and I’d accidentally synced the dust removal from the sky shots to some ground shots. I removed them on one, copied the develop settings, and pasted on all the others. It refused to remove them. I could add more, but I could not sync removal. I had to remove them individually on EVERY image and I was not happy. I’ll have to test this further and report it as a bug if it repeats. Then again, it could have been similar to your issue and all is well after finally closing it and starting over as it seems to work fine this morning. I’ve used LR since v.2 and have not come across this problem. Hope I never do!!! I haven’t actually seen this bug despite using Lightroom for many years. However, the bug that I always get is when exiting Lightroom, it prompts you to backup lightroom. Since I do my backup differently, I always click “Skip until next week.” It won’t. If I exit again later today, it still prompts me. That is not a bug. That is how LR works. If on a Windows machine, go to edit>catalog settings>Back up catalog>click down arrow and choose never, if you do your own backups. You guys who do not have this problem are lucky. I thought it was only my program and that I had a corrupted program. But this article proves that it is indeed a bug that needs to be fixed. My problem will start when I hit Ctrl+Z to undo. Then a preset is applied. Try to get out of LR by using menu exit and cannot. Have to hit the red X just like everyone else. Happens randomly and I don’t do batching so that could not be the culprit. Funny thought….I think LR just gets tired and goes bonkers!! Running Win7 Ultimate, 16 gbs ram, 64 bit, i7 cpu, double displays but will have program on main display and tutorial running on second display. Using LR4. Have not upgraded to 5 yet. Hope Adobe reads the comments on this site and fixes bug. I’ve used LR since version 1 and currently use version 5. I received version 1 for nothing because I had Raw Shooter Premium when Adobe bought them out and came up with LR. I’ve never had this issue come up. I have had a similar experience when I used Ctrl-W and saved an image back to LR5 from PS CS6, the image that appeared in LR that was saved had a B&W preset applied. I wasn’t able to remove it from history. So, I had to reopen in PS to edit original image, unchecked a layer, rechecked the layer, and then saved. When I went back into LR the image was as it should be with no preset applied. I use windows 7, CS 6, LR5, 64 bit, 16 gig ram, single screen. Original images on a 2T Seagate 7200rpm using a Thermal Lake Black X. Been using 32-bit Windows versions of LR for years and never seen this bug, although I NEVER close LR via the File/Exit; I always use the ‘X’ at the top right.. However, now running LR5.2 RC 64-bit under Windows 8 and I have seen the Ctrl-Z / apply preset bug a few times. I thought it was something new. This is real big time annoyance! I have came across this bug a lot during different versions of LR. Mostly It occurs when I need undo. It really kills me, because when I tap Ctrl-Z, there’s always need for undo something crucial. The developing module operations have the history, that saves. With 5.2 RC it seems to be triggered by File/Exit so often that I really avoid File menu and use Alt-F4 instead. I am still hoping that it’s fixed in final 5.2, but really I doubt that. Interesting. I have had LR almost since the start, with version 1 or at least 2. I have never seen this problem. I run it on a PC with Vista and a laptop with Windows 7. I currently have version 4.4. I will eventually upgrade to version 5.x, once I get a new desktop with higher than a Vista OS. (Version 5 doesn’t work with Vista from everything I’ve read). But one thing I don’t think I have ever done is exit LR by File Exit. As long as I can remember, I think I have always used the X in the upper right hand corner of the screen. I don’t think there is anything wrong with doing this, is there? I don’t think I want to start using File Exit, if there is indeed a bug associated with doing so! I have had 2 recurring bugs that come to mind. 1. For as long as I can remember, sometimes, if you move a slider in the Develop module, but in the same move, you move it back to zero (or whatever its starting point was), then a line will appear in the history, even though I did not actually change anything permanently. That history line will show a change of “0”. I don’t think this has happened with all sliders, or even with most, but I am pretty sure it happens in particular with the Black Point slider. But, it does not happen all of the time. I did report this on a LR forum; the response was that it could not be duplicated. Not a major issue, but it is a bug as far as I’m concerned. 2. One very annoying problem I have seen for maybe a year or two is that when I first launch LR, it sometimes takes a noticeable while for any pictures/previews to show up. I just now launched LR, and it took 20 seconds before any previews appeared. But, after exiting, waiting a short while, I launched LR again before I finished this comment, and the previews showed up almost immediately. I think I first noticed this problem shortly after I upgraded from version 3 to version 4. Again, it does not happen all of the time, but it has been happening a lot the past 3 or 4 days. Before that, it had not happened in awhile. I don’t know if this is a LR bug or something else, but it is concerning. Nasim, I’m sure you know this, but if you do a search on Lightroom and Control Z, you do see a lot of people commenting on this being a problem. In this thread, item number 38 from AlanUniqueName seems to indicate at least one condition under which the Ctrl Z condition occurs: forums.adobe.com/thread/1029388 He responded to this recently, July 2013. Alan indicates that the problem was reported some time ago to Adobe, at least a year. So I think Adobe probably knows about this problem, but it certainly wouldn’t hurt to have someone like you report it again to them! By the way, I only have a single screen setup. has anybody ever experienced the broken behavior, i.e. the application of presets, when using the File → Undo command instead of Ctrl-z? And what happens if you do File → Redo or Ctrl-v, respectively, after Ctrl-z erroneously applied a preset? This might help in analysing the bug, so, maybe someone can report on this. The Ctrl-Z bug has plagued me on both computers since version 3 (and probably 2, but I don’t remember now ). Lately, it’s worse than ever, happened 4 times in the past 30 minutes. Aaargh. I’ll try the File > Undo to see what happens. Yep, happens regularly. Windows 7 64 bit. Often after long sessions or a while after waking from sleep. Multiple monitors, though I usually only use one for LR. Often it already manifests by doing CTRL-Z (without trying to exit LR first), sometimes when exiting. Usually only annoying, but as you experienced as well, the moment I closed with 100+ photos selected that I had just exported, I had to undo their history one by one. I run into this problem all the time. It has been happening a lot with 5.3. Sometimes you don’t realize a preset has been applied and end up publishing the photo. Windows Pro 64bit. Typically the Undo doesn’t work and I have to click on a previous version in history to get it back. Other times just by selecting another preset the applied ones disappear. I’ve been using LR through versions 3 to (now) 5.3, and I’ve only just hit this bug for the first time. The one thing that’s common to both my and what appears to be others’ experience of it is that I’d been editing for an unusually long period of time; approximately eight hours, having gone through about six import / edit / export sessions or many hundreds of images within that time period, and with no exit / reloads. My sys : C2Q/8GB/Win7Pro 64-bit. Well, I too thought it was just me or my particular installation, till I got frustrated today and decided to seek some help and found you guys. The screwed up UNDO makes me feel like Clark Griswold trying to get the Christmas lights to work. AAAARRRRGGGGHHHHH!!! Win 7 64-bit, Quad Core Intel, 8GB Ram, Lightroom 5.3. I first experienced this in LR 5.2. But whatever the cause, it is the first time since starting with LR 2 a few years ago that I have experienced this particular issue, but I see we don’t seem to have Adobe’s attention so I suspect it won’t be the last. I now (or at least last time I exited) get the Exit failure as well. Had to Red-X quit, so I guess I’m experiencing this problem full on. My work around is to either restart LR, then go back a few steps in Develop and perform a do-over, or, if I’m not that invested in the image yet, Remove the image from LR, Delete its xmp file from the disk, then reimport the image through Sync Folder command. That brings in a fresh copy, and I go from there. Anthony above seems to be onto something … given the similarities of the issues and the randomness of the applied preset, I’d suspect an overflow of some sort bashing up the shortcuts in memory and making life miserable for us. Just adding my voice – I also get this bug, more and more frequently. All keyboard shotcuts and all menu commands apply a different preset instead of the action they are supposed to (the same preset for that session, but each time the bug occurs the commands apply a different preset to one the same command applied previously.) I use Alt+F4 to exit. Occurs sometimes after a while of editing and sometimes after a few minutes. (I just exported a catalog of over 800 images and then exited, when the bug occurred – applying a preset to all the edited imagses! Fortunately I had the exported catalog as a backup! Windows 7, single monitor, genius pen tablet. Getting this exact issue. Somewhat relieved to see that I’m not the only one seeing it, although it doesn’t look like there has been any progress on it? Could be something to do with memory/ram as it is occurring after bulk editing sessions. I have been using LR since LR2, and have only recently stumbled on the Ctrl-Z issue. And then only on my desktop PC, not my laptop (so far, anyway). I see that many people have had it for some time, on a variety of systems. I have reported it on one of the Adobe forums, but no response from Adobe. The only difference in my environment today versus before the issue, is that I have installed a pile of presets. No idea if this has anything to do with anything, as the presets are on both systems. Of course, my edit sessions tend to be longer on the desktop than the laptop. So, I suspect a memory leak somewhere, where a chunk of memory gets overwritten somehow – it’ll be a real beast to find, I’ll bet. My environment is Quad Core PC with 8GB RAM and 500+GB of free HD space and a 1GB nVidia graphics card. As a workaround, I pretty much restart LR any time I’m going to do some heavy duty LR editing – most of my LR editing is very quick before I move to PS. Yep, this is all sounding very familiar. Long editing sessions, and likewise I have a pile of presets installed, although I only ever use about 2% of them in any given session. As I said earlier, I suspect some form of memory leak or fragmentation, but the silence from Adobe on this issue is more irritating than the problem itself. Keep an eye on this bug report: feedback.photoshop.com/photo…ot_working It appears to be related to the number of presets installed, and they’re working on a fix. I am appalled to hear about this problem (I have not experienced it but I am a Mac user). It shakes my confidence in Adobe’s commitment to their customers. This is a terrible problem. I did not see in reading where anybody tried to contact Adobe. Has anybody tried to contact Adobe, upper level support, and if so, what has been Adobe’s response? Postscrip – I just realized this was from 2013. Adobe has since corrected the bug, correct?